For the last five years, I have celebrated Angie Day. Every year around January 30th, magical things connected to Angela Lansbury happen therefore I proclaimed it a day of celebration. This year, to the celebrate the Fifth Annual Angie Day, I threw a party. We listened to some select recordings and then watched home videos of stage performances, a couple of episodes of Murder, She Wrote and ended the evening with The Manchurian Candidate, which is arguably her best film appearance and one of the best, period. Needless to say, laughs and champagne flowed. Like clockwork, within days of Angie Day, yesterday I was informed by my friend Susan, a Scot and fellow Angie fan, of more joyous news. 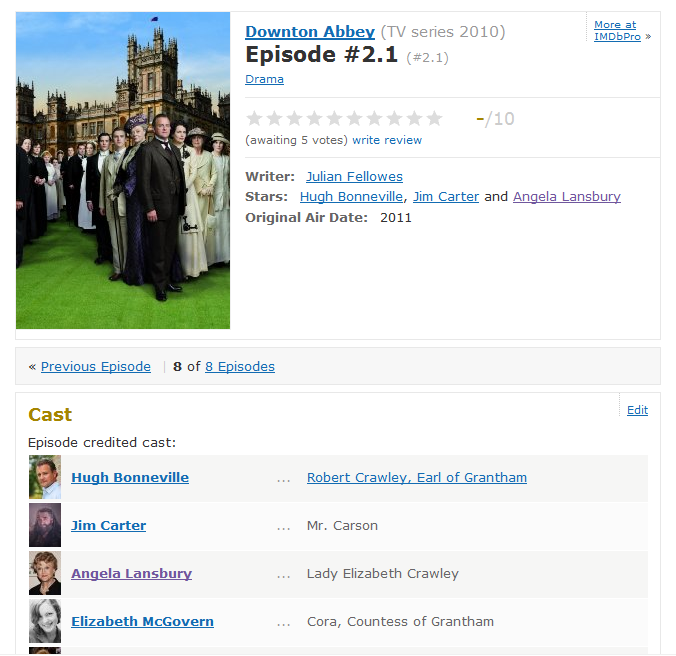 Angela will join the British series Downton Abbey as "Lady Elizabeth Crawley." Fortunately for us yanks, Downton Abbey was imported by PBS as part of its Masterpiece Classic series. Downton Abbey, the story of a noble family and their servants in the years immediately prior to World War I, was written by Julian Fellowes, who won the Oscar for Gosford Park . My fellow Anglophiles and I were glued to this series on PBS and I have already watched and re-watched the UK version on iTunes. The cast is out of this world and Dame Maggie Smith as "Lady Violet the Dowager Countess," is nothing less than divine. I have no doubt that we will be in for a treat as we watch Angela as "Lady Elizabeth" face off against "Lady Violet." I believe the two characters are sisters-in-law and most likely nemeses. Filming for Series 2 will begin in March and will air on ITV in the UK in the fall, according to the Guardian. Of course, we may not see the episode on PBS until the next Angie Day, but we know it's on its way! which is due out in theatres this summer, will be in England around March. One could speculate that she might extend her stay across the pond and accept the role as "Mrs. Higgins" in the upcoming West End production of Pygmalion , opposite her former co-star Rupert Everett. Could 2011 be the year that her CBE is finally upraded to DBE? She's already a Grand Dame to us after all. So, happy Angie Day everybody! Angela Lansbury queen of stage, film and screen. Look forward to seeing her in the series - whenever we get it. Angela Lansbury vs. Maggie Smith? Ringside seats for this Nipper!! FYI Downton Abbey is available for instant play on Netflix.